This video shows the treatment results on a patient that had significant crowding of the lower teeth, with a blocked out lower canine. The orthodontic treatment was done with braces on the upper and lower teeth. 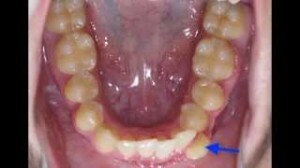 The results were achieved without the removal (extraction) of any teeth. In most cases these days, we are able to treat patients without having any teeth extracted. That can be a challenge in cases like this where the person has significant crowding and there is one tooth that is completely blocked out of the dental arch. There are several techniques we use to make enough room for blocked out teeth like this. We expanded both the upper and lower dental arches. Basically, this means we uprighted the side teeth and widened them a little bite. This widening makes more room for the teeth. The lower front teeth were also very upright. Looking down at the lower front teeth from above you can see more of the front surface of the teeth than the back side of the teeth. For teeth to fit normally, the front teeth should actually be angled forward. We angled the front teeth forward for this patient, and that also made more room. The final technique we used is called interproximal reduction of some of the lower teeth. This is a fancy way of saying we went in between some of the lower teeth and made them a little bit skinnier. Usually we use a sanding disk in between the teeth to do this. This technique is very effective in allowing us to straighten the teeth without having to resort to dental extractions to make enough room. This interproximal reduction is pretty quick, the patient does not need to be numbed up to have it done, and it stays well within the enamel of the teeth so there isn’t any sensitivity afterwards. The use of these three techniques allowed us to make enough room for all the teeth to fit. For more patient education videos, check out our YouTube Page. This entry was posted in Kyger Orthodontics YouTube Channel, Patient Education Videos and tagged arizona, az crowding, dental expansion, interproximal reduction, IPR, marana, nogales, non-extraction, oro valley, orthodontics, orthodontist, sierra vista, tucson, vail by DrDelKyger. Bookmark the permalink.